Academy Award winner Jennifer Lawrence stars in this year’s highly-anticipated movie “Joy” this awards season directed by of David O. Russell that probes four decades in the upward-moving life of a single-mom-turned-business-magnate to explore how daring, resilience and the persistence of vision carry people from the ordinary into extraordinary moments of creation, striving and love. 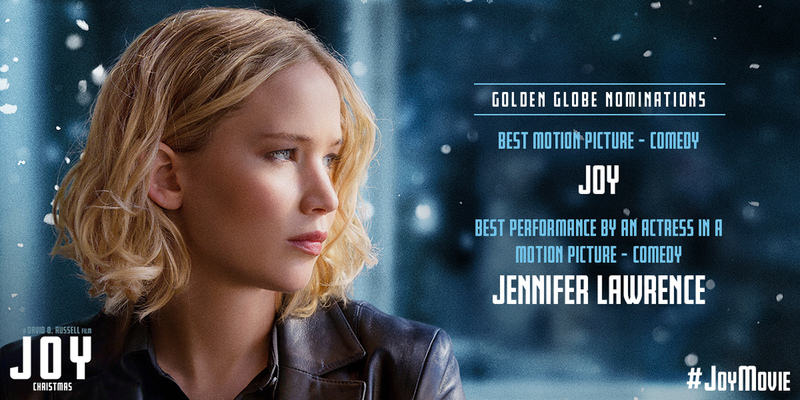 “Joy” has recently been nominated for two major awards in the upcoming (2016) Golden Globes – Best Motion Picture, Comedy and Best Actress In a Motion Picture, Comedy (Jennifer Lawrence). "I am incredibly grateful to be recognized by the Hollywood Foreign Press for my role in JOY. It was an enormous privilege to play such an amazing woman. And it is an honor to be among the other extraordinarily talented women in this category. I share this with David O. Russell and the incredible cast and crew,” says Lawrence on her nomination. The movie is based loosely on the life and rise of inventor and home shopping star Joy Mangano, the genre-blurring story of JOY follows the wild path of a hard-working but half-broken family and the young girl who ultimately becomes its shining matriarch and leader in her own right. The result is an emotional and human comedy about a woman’s rise – navigating the unforgiving world of commerce, the chaos of family and the mysteries of inspiration while finding an unyielding source of happiness. “Joy” follows on the heels of David O. Russell’s “The Fighter,” “Silver Linings Playbook” and “American Hustle,” which between them garnered 25 Oscar nominations. Each unleashed an unforgettable array of cinematic characters yet also honed in on a singularly compelling idea: the allure and trials of re-inventing oneself. Joy takes that same idea somewhere new – as Russell takes on the question of how one person, confronted with madcap circumstances, endless obstacles and a long road of self-searching, forges a meaningful, joyful life. While Joy’s life moves forward, the film’s style hearkens back in time, revisiting and redesigning the craftsmanship and melodrama of classical Hollywood cinema for our image-laden times. Joining Lawrence is a typically wide-ranging Russell ensemble including Robert De Niro as Joy’s hot-tempered yet hopelessly romantic father; Edgar Ramirez as Joy’s ex-husband, a struggling musician living in the basement … with her father; Diane Ladd as Joy’s insightful and influential grandmother; Virginia Madsen as Joy’s soap-opera addicted mother; Isabella Rossellini as her father’s well-off Italian lover; Dascha Polanco as Joy’s life-long friend and confidante,; Elisabeth Rohm as Joy’s rivalrous sister and Bradley Cooper as the mogul-style home shopping executive who becomes both Joy’s ally and adversary. “Joy” opens very soon in Philippine cinemas this February 2016 from 20th Century Fox to be distributed by Warner Bros.